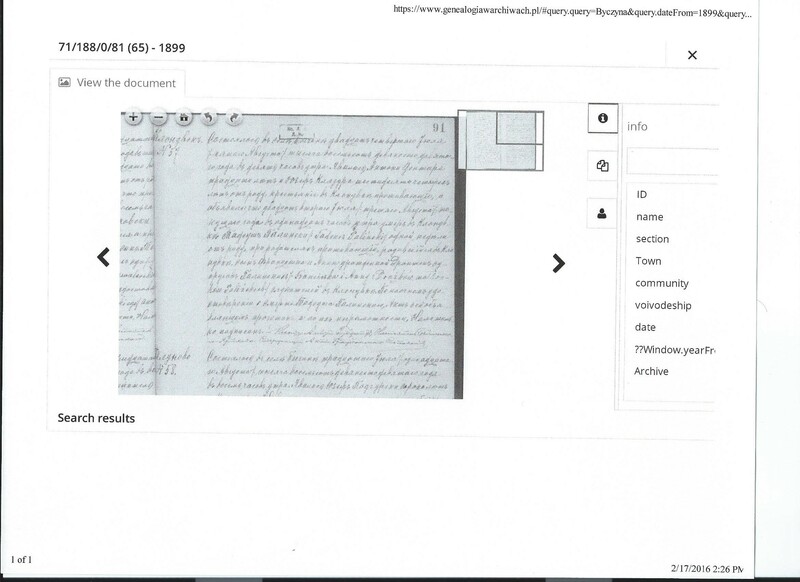 Here is the place where you can upload scan or picture file of your ancestors church record handwritten in the old Cyrillic Russian with request of translation it into English. Could you translate this record for me. I found another Tadeusz in the Torun Archives Byczynz 1899. It may be a marriage record. It happened in village Byczyn on 24 July (5 August) 1899 at 9 a.m. Appeared Antoni Zientara 30 years old and Józef Klazura 64 years old peasant both living in Kłonówek and they said that on 22 July (3 August) 1899 at 11 a.m. died in Kłonówek Tadeusz Paliński at the age of one week, he was living with his parents, born in Kłonówek, son of Paliński Franciszek and Palińska Anna maiden name Drążek both servants in Kłonówek. Thank you marcelproust for the fantastic job translating my previous census document request. May I please have this page translated too? Thank you for previous translations. 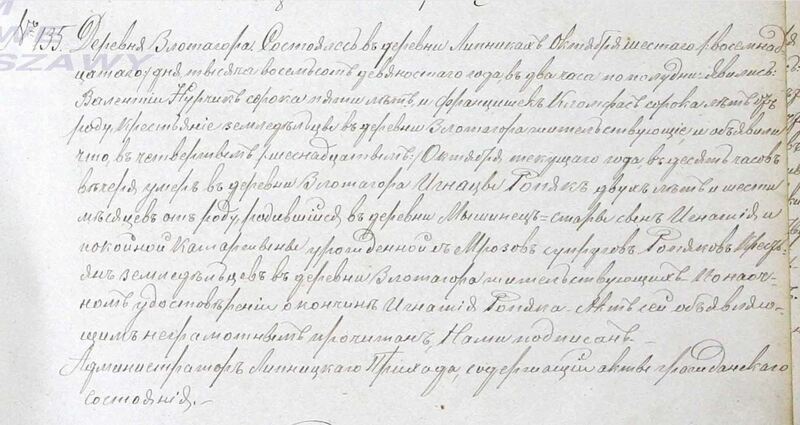 Could you please translate the birth records from Lublin RC church regarding Wyrostek & Pawlowich. I would very much appreciate a translation of the attached record. It is the death of Ignacy Ropiak in 1890. His parents were Ignacy Ropiak and Katarzyna Mroz. It happened in village Lipniki on 6 (18 )October 1890 at 2 p.m. Appeared Walenty Nurczyk 45 years old and Franciszek Klonfas 40 years old both farmers livinb in village Złota Góra and they said that on 4 (16 ) October 1890 at 10 p.m. died in Złota Góra Ignacy Ropiak at the age of 2 years and 6 months, born in village Myszyniec Stary, son of Ignacy Ropiak and dead Katarzyna Ropiak maiden name Mróz both farmers living in village Złota Góra. It happened in village Czernice on 31 January (12 February) 1890 at 4 p.m. Witnesses: Franciszek Pszczółkowski worker from Żebry-Kordy 33 years old and Jan Żebrowski part owner (kind of nobility who owned part of village or had some land) from Żebry-Kordy 54 years old. Bride parents: dead Tomasz and living Marianna maiden name Czaplicka worker. There were 3 church annoucements in Czernice and Pawłowo churches on 7 (19 )January, 14 (26 ) January and 21 january (2 February) 1890. There were no premarital agreement. It happened in Ostrów on 29 July (11 August) 1907 at 4 p.m. Appeared Tomasz Pawłowicz 28 years old farmer living in Ostrów in the presence of Antoni Wawrysik 28 years old and Grzegorz Antonik 30 years old both farmers living in Ostrów and they show us female chils and said that he was born in Ostrów on 24 july (6 August) 1907 at 7 a.m. from legal wife of Tomasz Pawłowicz - Katarzyna maiden name Gruszczyk 20 years old. Child was baptised by priest Michał Dudziński under the name Genowefa. Godparents: Antoni Wawrysik and Aleksandra Antonik. It happened in Krasnostaw on 16 (29 ) August 1908 at 5 p.m. Appeared Łukasz Wyrostek, farmer from village Orłów Drewniany 44 years old in the presence of Antoni Roman 44 years old and Walenty Zdrzyłowski 35 years old both farmers from village Orłów Drewniany. They show us male child and said that he was born in Orłów Drewniany on 16 (29 ) August 1908 at 2 a.m. from his legal wife Agnieszka maiden name Przysiężniak 25 years old. Child was baptised by the priest Wacław Czechochoński curate, under the name Jan.
Godparents: Antoni Roman and Zofia Burdan. It happened in city Krasnostaw on 16 (29 ) July 1904 at 10 a.m. Appeared Antoni Bassa farmer from village Kryniczki 34 years old in the presence of Franciszek Antyga 47 years old and Antoni Wojnarowski 40 years old farmers from Kryniczki. They show us female child and said that he was born in Kryniczki on 14 (27 ) June 1904 at 12 noon from legal wife of Antosi Bassa - Marianna maiden name Kostrzanowska 22 years old. Child was baptised by priest Dionizy Błoński curate of Krasnostaw parish under the name of Anna. It happened in city Krasnostaw on 13 (26 ) June 1902 at 11 a.m. Appeared Stanisław Wyrostek farmer from village Orłów Drewniany 30 years old in the presence of Andrzej Stećko 28 years old and Józef Wyrostek 36 years old both farmers from village Orłów Drewniany and they show us male child and said that he was born in village Orłó Drewniany on 7 (20 ) June 1902 at 12 noon from his legal wife Franciszka maiden name Chartanowicz 31 years old. Child was baptised by the priest Dionizy Błoński curete of Krasnostaw parish under the name Jan.
Godparents: Andrzej Stećko and Zofia Chartanowicz. Marcel. Thank you so much for the last translation. 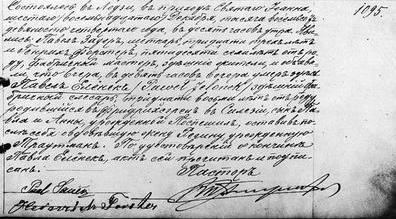 Could you please help with the marriage record of my 2nd cousin 3x removed marriage. 1. 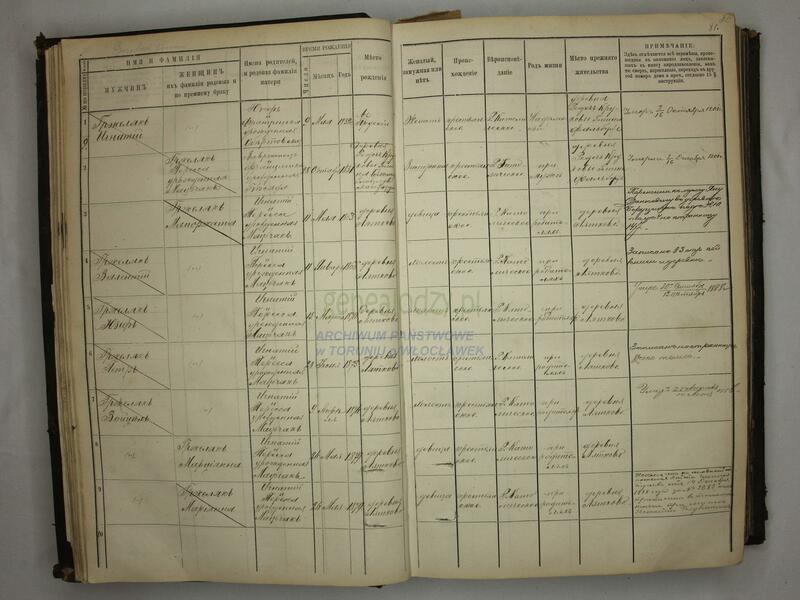 Grzelak Ignacy, son of Józef and Franciszka maiden name Obertowska, born on 9 May 1832, cant decipher place of birth, married, peasant origin, catholic, farmer, previous place of living village Redecz Krukowy in Falborz community, died on 3 (16) October 1901. 9. Grzelak Marianna, daughter of Ignacy and Teresa maiden name Maćczak born on 26 May 1879 in Latkowo, virgin, peasant origin, catholic, living with parents, previous place of birth Latkowo. Excluded on the basis of the ordinance of Radziejów mayor since 14 December 1898 under the number 3689 and signed with her husband Ignacy Regulski. It's been sometime since my last visit. I've managed to uncover a new record that I am in need of help translating. This is the record for my 2x great grandfather who has been one of my greatest mysteries as of late until now. Any help that can be provided with this as always is greatly appreciated.